^ a b c d e Jefferson, T.A., Karkzmarski, L., Laidre, K., O’Corry-Crowe, G., Reeves, R., Rojas-Bracho, L., Secchi, E., Slooten, E., Smith, B.D., Wang, J.Y. & Zhou, K. 2012. 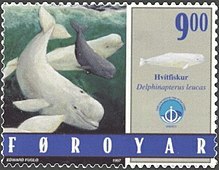 Delphinapterus leucas. The IUCN Red List of Threatened Species 2012: e.T6335A17690692. doi:10.2305/IUCN.UK.2012.RLTS.T6335A17690692.en, Downloaded on 07 June 2016. Lowry, L., O’Corry-Crowe, G. & Goodman, D. 2012. Delphinapterus leucas (Cook Inlet subpopulation). 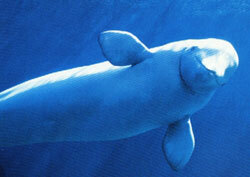 The IUCN Red List of Threatened Species 2012: e.T61442A17691385. doi:10.2305/IUCN.UK.2012.RLTS.T61442A17691385.en, Downloaded on 07 June 2016. ^ a b c d e Barbara E. Stewart & Robert E. A. Stewart, "Delphinapterus leucas," Mammalian Species, No. 336, American Society of Mammalogists, 1989, pp. 1-8. ^ Alexander J. Werth Thomas J. Ford , Jr., marine mammal science,2012.06.03, p.516. Reeves, Stewart, Clapham and Powell, National Audubon Guide to Marine Mammals of the World, Random House. ISBN 0375411410. Gregory M. O'Corry-Crowe, "Beluga Whale" in Encyclopedia of Marine Mammals, Perrin, Wursig and Thewissen eds., Academic Press, pp. 95-99. ISBN 0125513402.